Volunteering your time can be difficult to do, especially when your busy with hobbies and activities in between. Callia Barwick, a junior at Canfield High School, has learned to juggle it all. Callia finds it all a thrill and says it makes her life feel complete. There are many things that make up each and every individually. For Callia, Her activities includes cheerleading, dance, track, riding horses, 4-H, school plays, student council, drama club, and teaching Sunday school,while being involved with these hobbies she still makes time for her volunteer work. 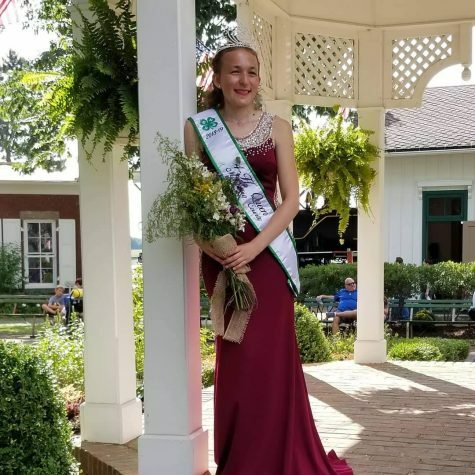 “If you don't know what 4-H is,it's a youth organization that helps over 6 million kids around the world and basically promote the skills that they might not get in school and create these kids into leaders” said Callia. Callia discover 4-H thirteen years ago where her grandma found an ad in the newspaper, since Callia was a shy person, she realized after getting involved with 4-H she was able to overcome her shyness and become a leader, this lead her into doing even more volunteer work at her church. Callia loves hanging and helping out with the little ones in her classes and she explained how she enjoyed the experience while helping others, along with this she even had time to volunteer on the Friday night games and events to be the cardinal bird. Callia uses her quality time just to see others smile. Even though Callia has a busy life, she is looking forward to her senior year replaying it all over again.